Sign-A-Rama, Van Nuys. 818-908-8341. Your one stop full service sign shop. We are centrally located in the San Fernando Valley. Serving Los Angeles, Van Nuys, Sherman Oaks, Encino, Tarzana, Studio City, Northridge, North Hollywood, Burbank, Woodland Hills, Sun Valley and Sylmar. Specialize in channel letters, digital banners, car & truck wraps. any type of signs that will get results for your business. Identity is vital in today's highly competitive market. Sign-A-Rama of Van Nuys provides one-stop shopping for all your advertising needs, including interior and exterior signs, business cards, trade show displays, logo apparel and more. A well-designed sign can give you the identity your business needs. The logo and identity of your company are critical to its success. Promote your brand with the best in signs, vehicle graphics and digital outdoor banners! Advertising with signs is one of the greatest ways to get the word out about your business. Signs will work for you 24 hours a day for a lower cost than other forms of advertisement. Our line of promotion products will promote your brand and make sure your target audience remembers your name! Information is important to your clients and customers. Many small to medium size companies don't have the budget for a graphics and marketing department, which is where Sign-A-Rama of Van Nuys comes in! We can provide your company with everything needed to promote and market to your consumer, all in one convenient location. Centrally located in the San Fernando Valley, we service all surrounding communities including Van Nuys, Sherman Oaks, Encino, Tarzana, Studio City, North Hollywood, Burbank, Sun Valley, Northridge, Glendale, Pasadena, Pacoima, Sun Valley and Sylmar. 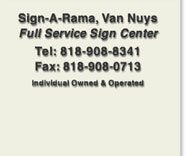 Signarama of Van Nuys is your ONE STOP full service sign center. Our service includes design, manufacture and install channel letters, interior and exterior metal and acrylic signs, car, van & truck wraps, banners, braille ada signs and custom neons.